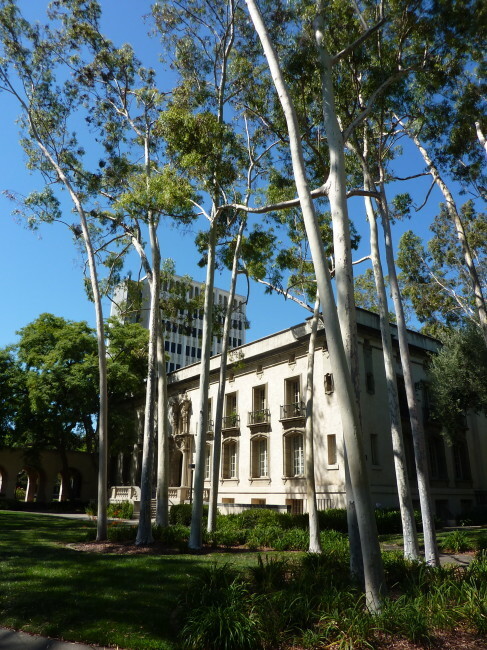 Although not smart enough to ever attend the California Institute of Technology (Caltech) as a student, I (and anyone else) can visit Pasadena’s prestigious university. 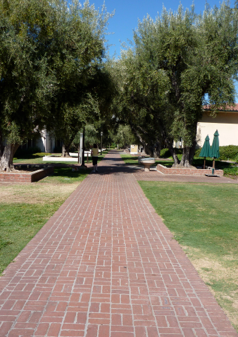 One way to enjoy the campus is to take the Olive Walk. It is called the Olive Walk because there are about 130 olive trees that are planted on the grounds. 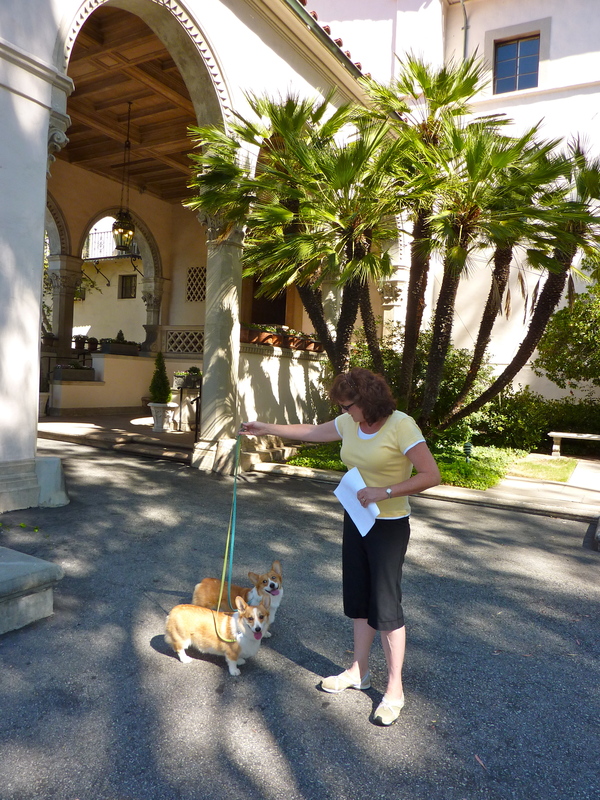 Our two corgis, Frankie and Remi, are always up for an adventure, so on this very warm Saturday morning, the four of us piled in the car for the short drive to Caltech. 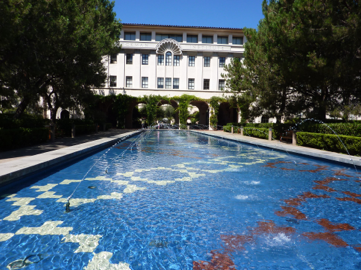 We parked nearby Caltech and strolled down a few blocks until we reached the Anthenaeum, which was constructed in 1930. They didn’t hold a formal dinner at the facility for a few months after its construction, so they could host an event for a special guest. 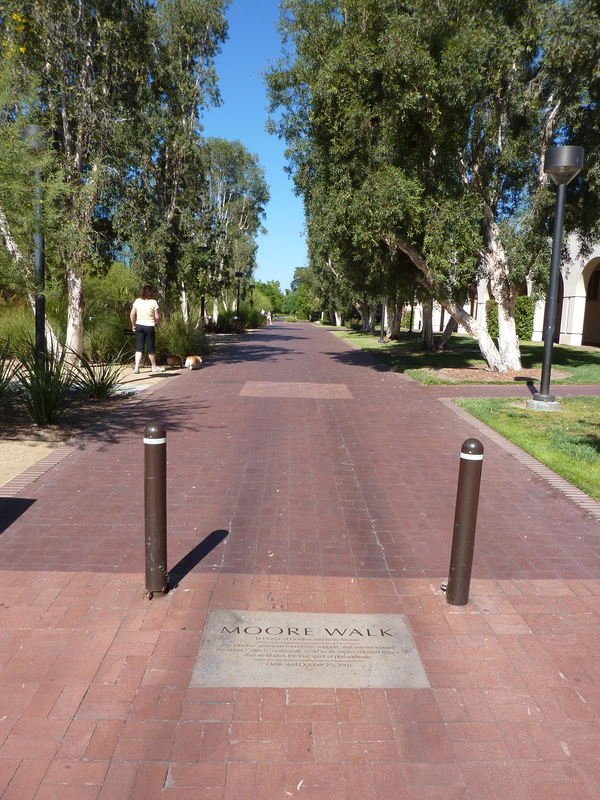 They waited until Albert Einstein arrived for a three month visit to the campus. To him, everything was relative. The Anthenaeum was lucky to be built at all. The university received a gift of stocks and bonds from a donor in 1929, and fortunately they cashed them in before the crash. 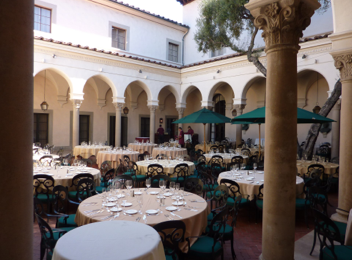 Today, the facility is used for special dinners and events. When we visited, they were setting it up for a wedding later in the day. Next, Tracy and I (plus the dogs) navigated the actual Olive Walk portion of the Olive Walk. They planted olive trees to go along with the Mediterranean theme of the Anthenaeum. 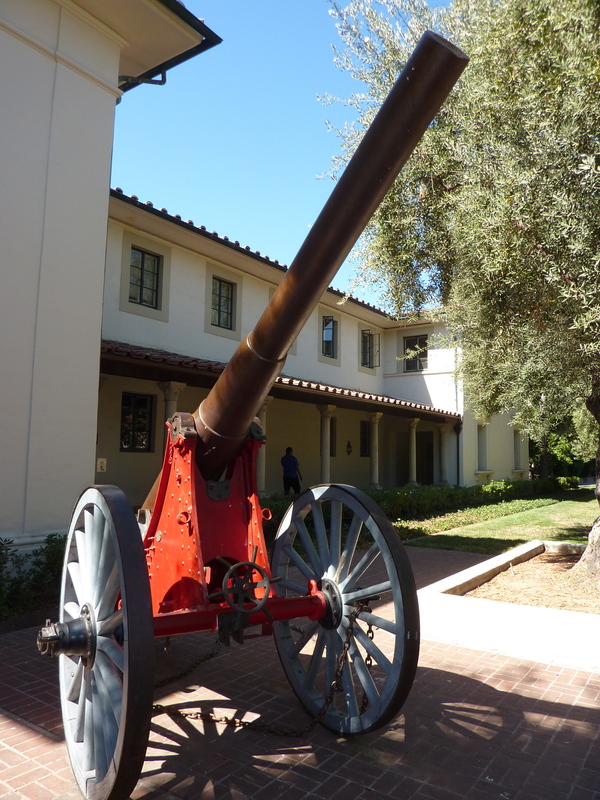 There was a 1.3 ton cannon in front of one of the buildings, which dates back to the Franco-Prussian War in the early 1870s. 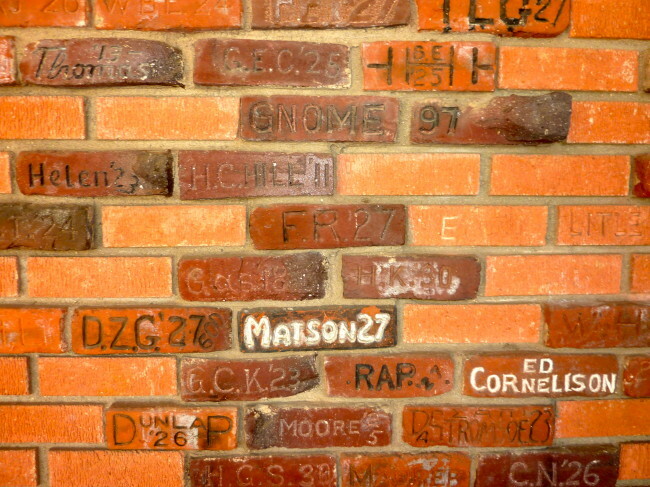 A little further down the Olive Walk was a brick wall with names inscribed on some of the bricks. These bricks came from the fireplace at an old Caltech hangout, The Dugout. For one dollar, students bought the bricks that helped fund construction. We walked by a building that was used as a huge clean room for grinding and polishing the mirror for the 200-inch Hale Telescope that is at the Palomar Observatory. 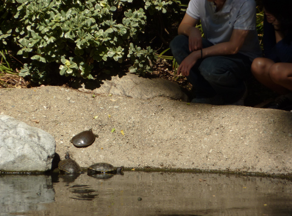 After walking a bit further, there was a pond surrounded by a garden. Upon closer review, we also saw dozens of turtles, and they were not of the fake variety. They were swimming in the pond, and we even saw a soft-shell turtle sunning himself on the other side. 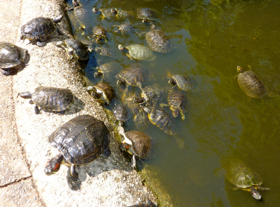 I don’t know how old the turtles are, but some of the rocks in this garden are up to 75 million years old (or slightly less than Zsa Zsa Gabor). Nest stop on our sojourn through Caltech was the nine-story Millikan Memorial Building. 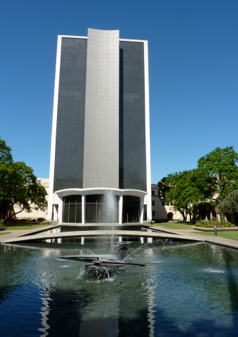 The building, which also houses the main campus library, was constructed to be able to withstand an 8.0 magnitude earthquake (I wonder if they’d rent a room to me). In all the years I have lived in the area, I didn’t even know this building existed. 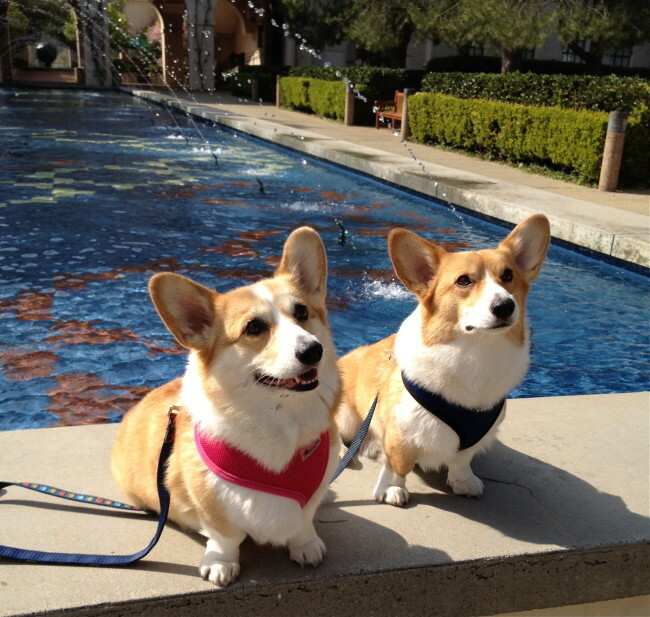 There is also a beautiful waterscape in front of the building, where the corgis asked to have their photo taken with the guy who gives them dinner each evening. 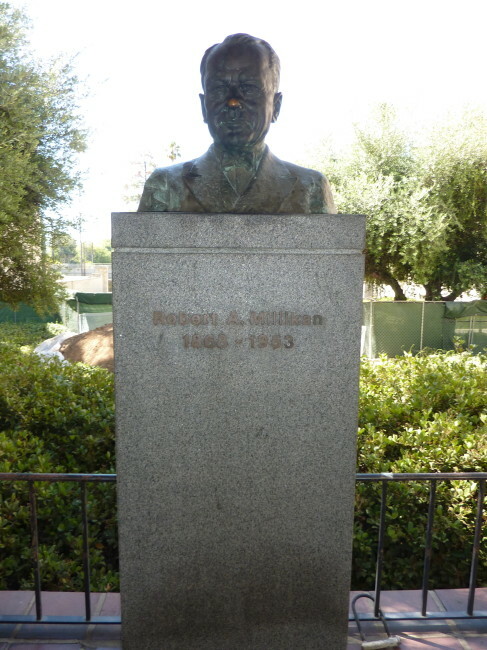 We happened upon a bust of Robert Millikan, who was the administrative head (no pun intended) of the Institute from 1921 – 1945. Similar to Rudolph, the bust has a very shiny nose. The reason? For decades, students have rubbed his nose for good luck before taking their exams. Hopefully Milliken’s genius rubs off on them, because in 1923 Millikan received the Nobel Prize for his measurement of the charge of the electron (now I see why i couldn’t get in this place). Crossing back across the bridge above the water-scape, we saw a 400-year-old Oak Tree and then a lovely rose garden. 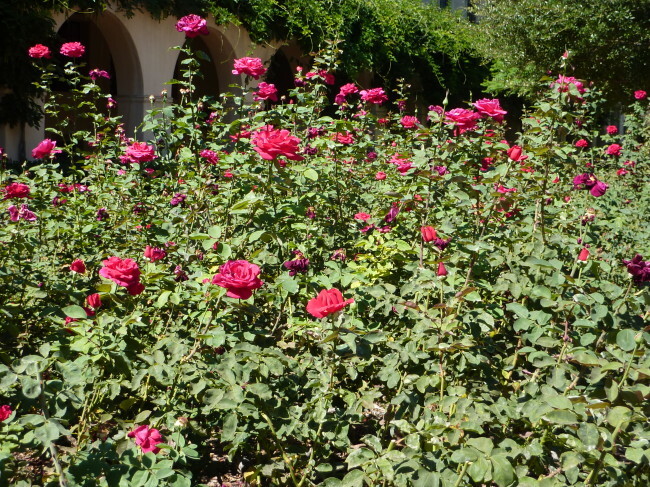 Tracy gets more rose gardens than I get credit for. 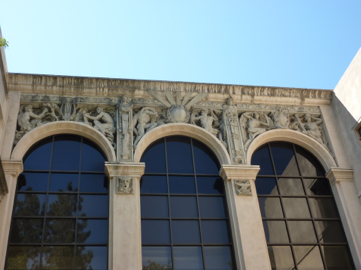 One thing we had noticed were the various reliefs that adorned the façade of all the buildings. 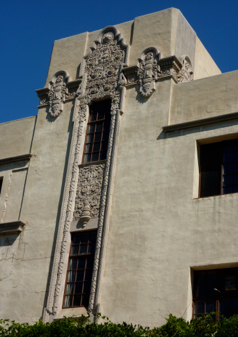 Each façade symbolizes the various types of research and studies that were done inside those buildings at the time they were built. We also ran into a few of the 900 undergraduate and 1,200 graduate students who attend Caltech. 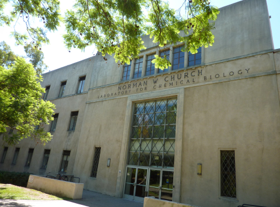 Next was a building with an interesting story behind it; the Norman W. Church Laboratory for Chemical Biology. You could actually call this story a pony tale. In the 1930s, Norman Church owned a race horse by the name of Proclivity. After winning a big race at nearby Santa Anita in Arcadia, there was an accusation that the horse had been doped (maybe they should have named him Lance Armstrong). 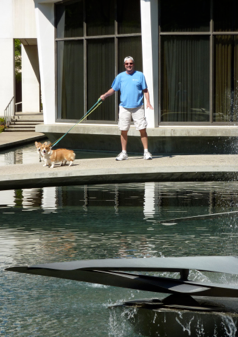 In an effort to clear Proclivity along with his own name and reputation, Church asked Caltech’s assistant professor of chemistry, Arnold Beckman, to do some testing on the pony. 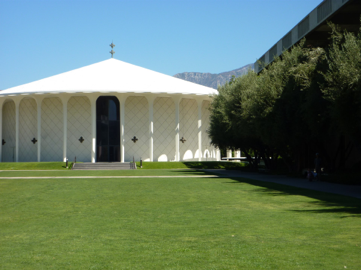 Beckman found no evidence of doping, and later in his life Church read about Caltech’s work in chemical biology. The grateful Church donated the funding of a new building. 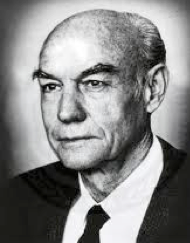 This lab is also famous for the work of Nobel Laureate Roger Sperry (below). 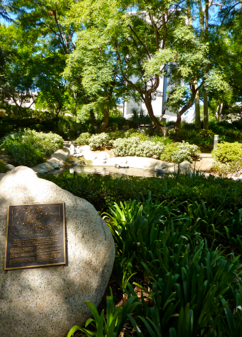 It was here that Sperry discovered that the left and right hemispheres of the brain each have unique capabilities. 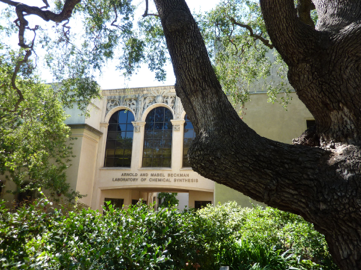 In all, 31 Caltech alumni and faculty have been awarded the Nobel Prize. 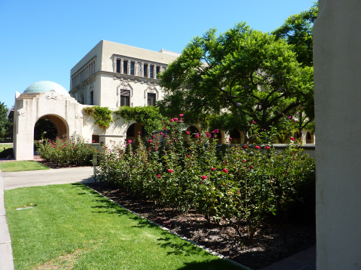 A unique archway on the Beckman Laboratory of Chemical Synthesis caught our eye next. These reliefs were designed by Alexander Stirling Calder (father of mobile inventor, Alexander Calder) in the early 1900s. The six figures (from the left) represent Nature, Art , Energy, Science, Winged Imagination and Law. Shortly thereafter, in the distance to the left, we saw a circular building that we first surmised was a church. 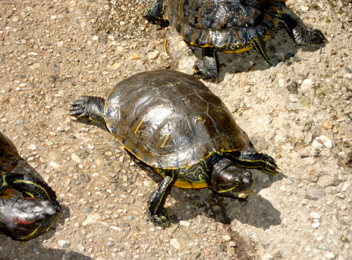 However, what we thought might be crosses from a distance proved to be something else. 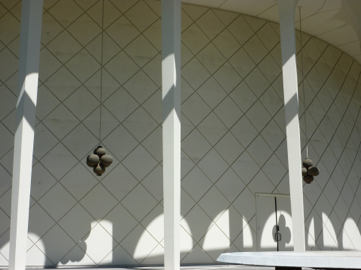 Indeed, they were lighting fixtures that simulated atoms and they were hanging outside the Beckman Auditorium, a facility that hosts lectures concerts, dance recitals and other activities throughout the year. One of our final stops was another beautiful water feature. 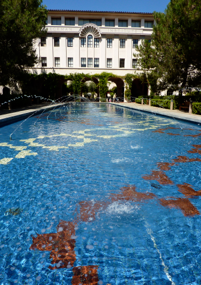 The rectangular, reflecting pool is cleverly called The Gene Pool (the floor of the reflecting pool is tiled in a double-helical pattern). 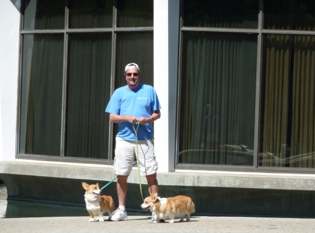 At this point, I looked at the dogs and they were pooped, and since my dogs (aka feet) were a little sore, it was time to call it a day, although the corgis wanted to take a swim. 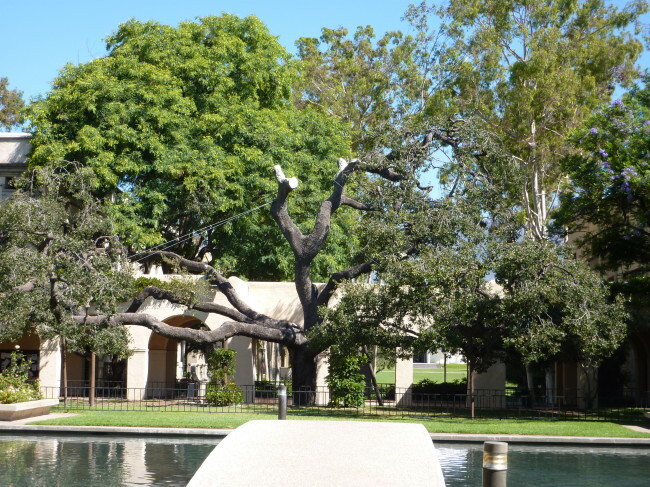 We walked back through the beautiful Caltech campus to our car. 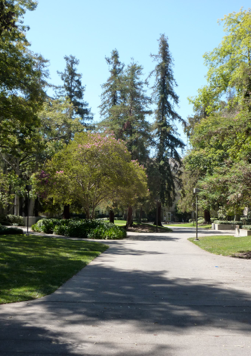 You can easily navigate the Caltech Olive Walk in 90 minutes or so. 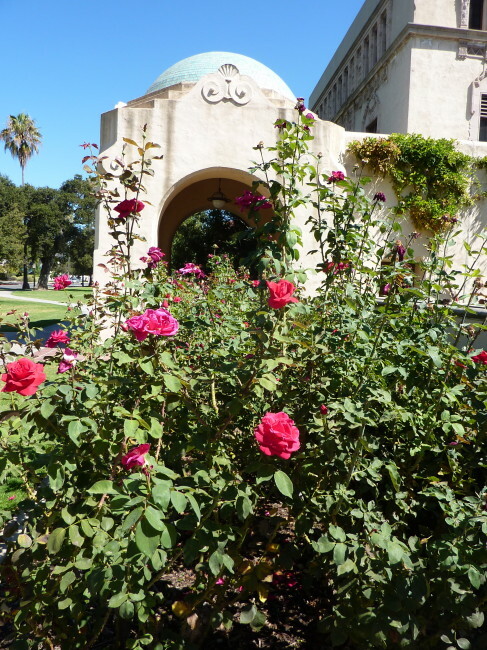 If you live near Pasadena or are visiting the area, and the day is nice, it is a pleasant way to get fresh air and some exercise. 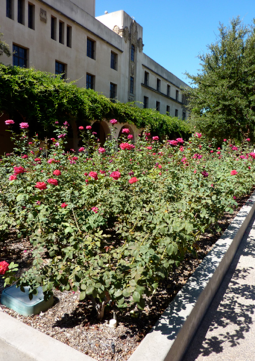 At the same time you can soak up information about the history of one of the United States‘ premier institutions of higher learning. I feel smarter already!